After some thinking and careful consideration on how I spend my time on CoinBakers I've come to the conclusion that I need to focus on seasonal strategy updates. The metrics I'm working on for the tooling should not be public. 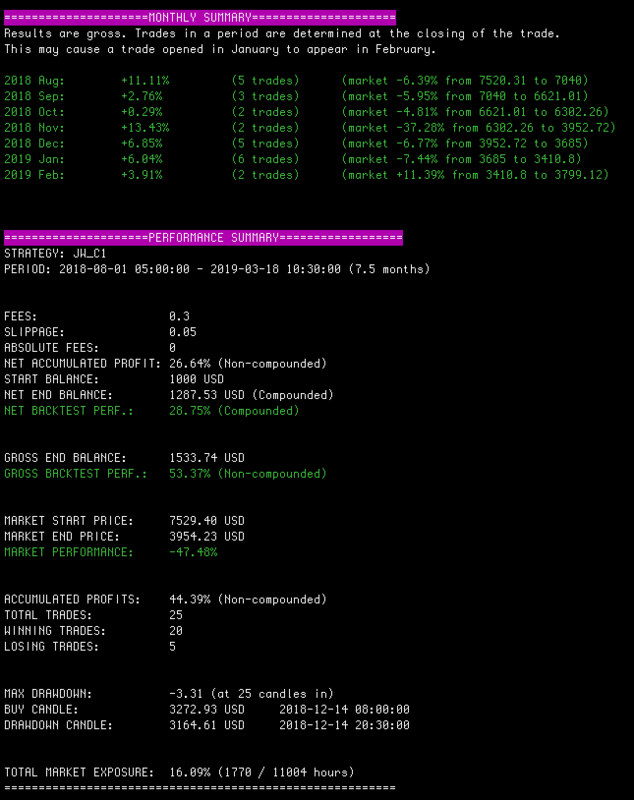 Those metrics and insights are very valuable, maybe the most valuable asset of Coinbakers. It would be better to utilize this myself to make the strategies better. I thought it would be easy to create an all-season strategy and sit back and relax. Can't blame me for that. Like with all-season tires, they won't perform specifically well in certain situations like winter tires in the winter. My time spent would be most valuable in creating seasonal/trend specific strategies. Those need to be evaluated and updated monthly and quarterly. They require tons of work and may only work for a couple months. However the performance will be much better than all-season strategies like V4 and V5. It comes down again to the master strategy. I don't like to have multiple strategies running and having them up for choice, it's just weak. I can make theoretically 100 strategies all specific to certain trends or situations. One at least will always perform well, but by making you choose one, you will probably never be in the one that performs well. I can then boast I catched a pump, but practically no one will be able to profit of that (long term). That's not how we work here at Coinbakers. There should be ONE strategy that makes those decisions. We win together, we lose together. But I don't want you to lose and I win. And also not the other way around. 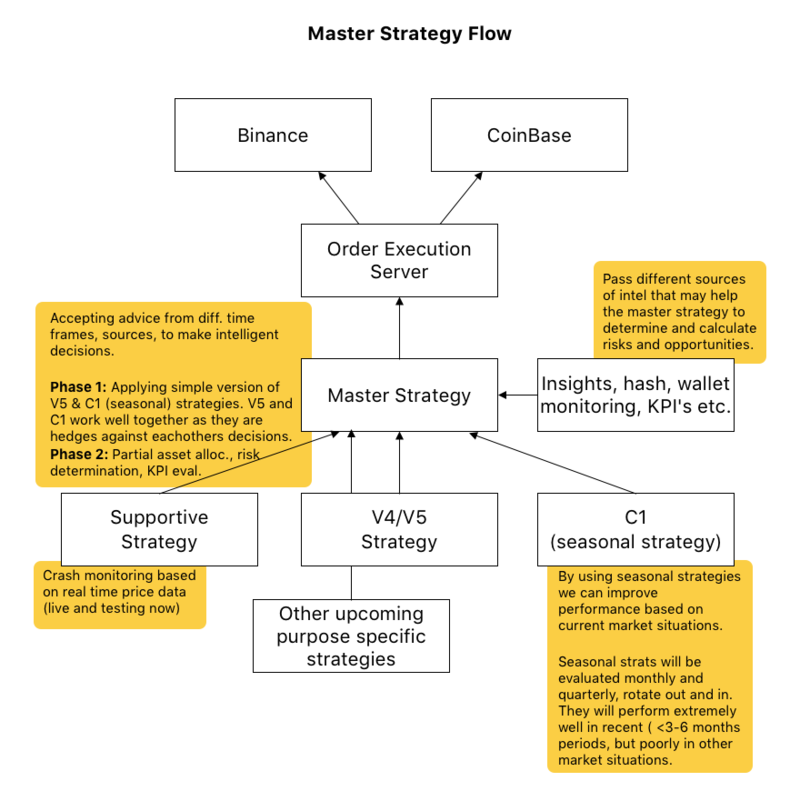 The Master strategy will be deployed in 2 phases so that we can improve time to market as early as next week or the week thereafter with a simplified version. The development of the supportive strategy really helps in cutting down the time for this, as it will work similar in most ways. My envisioned end goal of the master strategy is more complicated, so those features will be developed along the way. The crash trading strategy is an example of a seasonal strategy. I've had an early release running in production but tweaked it and will make it production ready next week. Then plug it into the Master strategy. With new updates to C1 I've made sure when outside of the season, it performs around~0 to -10% yearly performance. But in those times we would rotate it out of the Master strategy. It's just to make sure if it's ineffective it's not losing crazy amounts of our balance. However over the last 8 months, it would have made 53% gross and 28% net profit. Here's a monthly break down. The results are just batshit crazy considering the market we are in. It may be the end of how effective this is as the market trend seems to be changing, but the takeaway is that I'll be spending a considerable amount of time to keep seasonal strategies effective. In the background we run V5 and they will trade together. At first dumb and not aware of each other, but in later stages the Master strategy will. Sidenote: I also noticed the previously reported February performance was wrong (said -1.96% I think I used EUR close price by accident, while the market went up 11%, sorry about that). This means a position trigger may now come from V5 or C1 once the Master strategy is deployed. And from many more strategies in the future, all from within different timeframes and designed purpose. C1 runs on 30 minute candles for example. C1 is also a hedge against V5, reducing our risks. Whereas V5 may sell after a crash, C1 would buy in on certain triggers. This means the potential loss of V5, selling after a crash if that happens, may be (partly) mitigated by the buy in of C1. Imagine the perfect scenario, the crash monitor from the supportive strategy exiting the before or mid crash, C1 buying in after the crash and the market correcting itself pre-crash. This scenario of sudden crash -> recovery pre-crash prices, happened a lot since 6 months, so it's not entirely out of the question. Seems almost impossible and crazy. Exactly how I like it. When introducing the master strategy, you will not be able to select a strategy anymore. It's just one, the Master strategy. 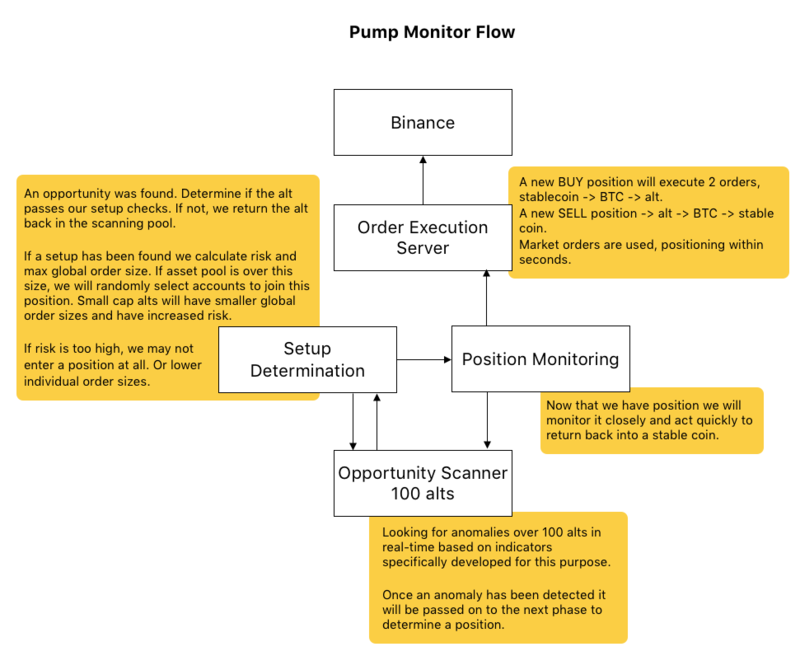 There will be one choice though, the pump monitor. You may also choose running this on a separate account. If you can't choose, just take 'm both right! This system works entirely different and makes a sensible separation, between the Master strategy trading USD-BTC and the pump monitor trading undetermined alts. Yep, thats right. Maybe in the future but not my main goal now. Tools will be developed internally though, but later when phase 1 is finished and I have gathered at least a certain amount of historical data. Tools are just ways to contribute to making signals, the core value are these signals and that's why I should focus on improving and keeping up the quality of these signals at all times. No matter how good indicators and tools you make, it's only the signal output that counts.